The Sepor Batch Ball Mills are constructed of 304 stainless steel (wetted parts), with structural steel frame and support structure. The rugged forged steel trunnions with hubs provide support for the shaft and give structural support for the mill ends. The mill is machined to provide a true alignment of the mill. The heavy duty running in oil gear reducers and chain drive will provide years of operation with minimal maintenance. The stands are constructed of structural steel with foot plates located on the four stand leg bottoms. 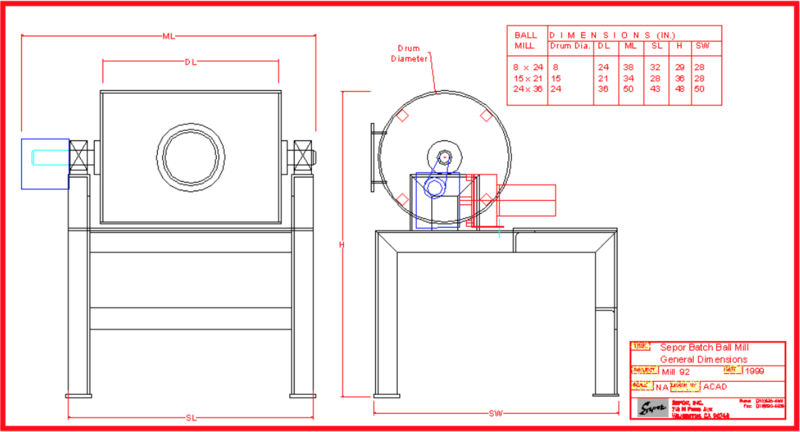 Heavy duty, self aligning bearings are used to insure years of properly aligned mill operation. The cover on the batch ball mills is held in place by means of easy to remove hand lugs. For discharging, simply remove the cover, place the media retainer screen in its place, and rotate the mill to the discharge position. A jog switch is provided for bumping the mill into position, or to dislodge material during discharge. The Batch Ball Mills have solid, welded in place lifter bars to help control the direction of flow of the balls and material by halting the sliding action of the balls against the shell and giving a more precise and correct angle of brake, where the balls achieve maximum impact falling back onto the material to be reduced. Motors are typically supplied for 3 phase current, for use with either 60 cycle or 50 cycle AC current supplies. Motor starters are installed in the mill controls supplied with the mill. 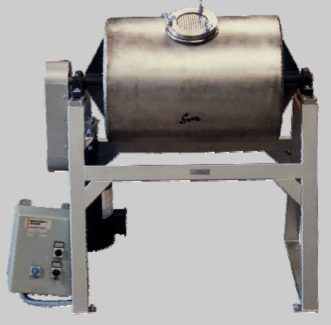 Based on 100lbs/CuFt material, following are max capacity of grinding per batch. 010E-200 8″ Dia. x 24″ Mill, 1/2 HP/110 V/1 Ph/60 or 220 V/50Hz 66 0.7 130 Lbs. 010E-201 15″ Dia. x 21″ Mill, 3/4 HP/110 V/1 Ph/60 or 220 V/50Hz 48 2.1 300 Lbs. 010E-202 24″ Dia. x 36″ Mill, 1 HP/230 V/3 Ph/60 or 380 V/3 Ph/50Hz 38 9.4 1,100 Lbs.